Science Fair Teacher Workshop: A Science Fair Teacher Workshop will be held at the Jackson Avenue Center in Oxford, MS on October 23, 2018. This workshop will be beneficial to both new and returning science fair teachers. We will cover topics such as category changes, rules updates, how to best prepare students, judging, and more. The workshop will be broken into both lower and upper fair sections. To register for this, email precollege@olemiss.edu. Another school year is here and it's time to think about science fair. While fairs are generally held in the spring, it is never too early to get started. The best projects usually begin much earlier than the date of your school fair. Coming up with an idea, doing research, conducting an experiment, collecting data, and presenting the results in a professional/neat format requires time and hard work. The rewards make the hard work worthwhile for a number of reasons. The skills and knowledge gained through experimentation; "doing science" much like scientists do science; and having an arena to present the study are invaluable experiences that provide each participant a lasting lifetime memory. Placed 1st, 2nd, or 3rd in any category. 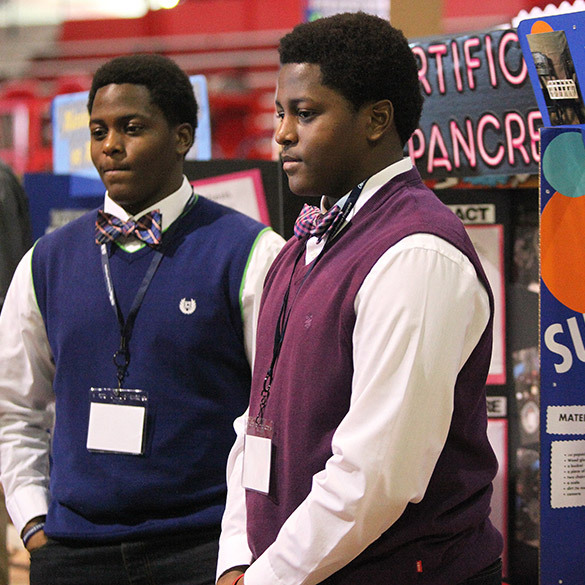 Mississippi Science and Engineering Fair has combined some categories for regionals. The study of the properties and reactions of inorganic and organometallic compounds. Studies exploring the science of the composition, structure, properties, and reactions of matter not involving biochemical systems or carbon. The study of carbon-containing compounds, including hydrocarbons and their derivatives. Studies exploring the science of the composition, structure, properties, and reactions of matter not involving biochemical systems. Whether you are a veteran science fair teacher or new to science fair, there is always a lot of information to filter through and usually not enough time to do it! There are tons of resources for you available on the Internet (i.e. Education.com) to give you science project ideas for your students and standard guidelines. Gather information on the topic. Test the hypothesis, and sometimes retest. Draw a conclusion based on the data. There are a variety of categories for science fair projects that students can choose from when developing ideas for their projects. Please visit the categories page for further details. The Upper Fair projects can range from a beginners level to advanced levels. The best projects are the ones that follow the scientific method and students can articulate their findings and explain the details of the project as well. It is sometimes common for students to find their project ideas on the Internet and follow the directions exactly, but they have very little idea of how to explain the project and its importance. Teachers, challenge your students to be scientists. Please remember – originality is key to any good project. Judges can tell when a student has copied another’s idea or if the project has been overdone. There is nothing wrong with advancing or building on a project that has already been done. The Lower Fair also hosts several projects ranging from easy to hard difficulties. The best projects of this fair are the ones that again follow the scientific method and can be explained by the student, but also has had little parental involvement. Parents should be asked to let their students completed their projects from start to finish with a little help along the way. A good rule of thumb is that parents should be less involved as students move from 1st grade to 6th grade. I am new to science fair, what do I need to do? Ask for student/parent interest. Send a simple half to one-page letter home to see if your students (and parents for lower grades) are interested in participating. Some science teachers can make this extra credit or a required project. Set a date for your school science fair. We recommend the fall semester. Send in “School Registration” form and school review committee (SRC) and institutional review board (IRB) forms to the regional office. Host your school’s science fair. Send in student project registration forms with abstract (and supporting forms, if needed) according to student’s grade division. You will receive word of projects accepted/denied. Attend the Regional Science Fair in Oxford, MS on the University of Mississippi campus and experience amazing projects! If your student wins, attend the Mississippi State Science Fair and Intel International Science and Engineering Fair (ISEF). Okay, parents…a science fair project can be overwhelming at first. If this is the first time your student has had to do a project like this, don't think that your project has to be the most advanced project out there! The best projects are the ones where the student learns about science; the scientific method; they can tell you, without pause, how they did it and why; and most importantly, has fun doing it! Students…this is not just another project for science class! This is the chance for you to explore science and experience something hands-on. You are the one who is control of your science fair project. Science is all around us and we experience it everyday, from the air we breathe to the touchdown made at the high school football game. Even if you are not strong in science, you can come up with a project that fits your strengths and tastes. If you are into sports, ask yourself how did he throw the ball 70 yards down the field. It may be more to it than he has just a strong arm. For those into fashion, ask yourself what fabrics and materials are best and why. It could be more than one fabric looks better than another. There are several projects that a student can do for the science fair and the project can be as difficult (or easy) as you want it to be. For the shoe-string budgets, many projects can be done with a few household items, without having to go to the store and spending a fortune. Not everyone has to come up with a hovercraft machine or a high-tech gadget. Typically, it is the simple projects or those at the student's level that tend to be the best because it is easy to tell they are passionate about it. That is the greatest reward of doing a science fair. Almost all science teachers will go over this method when preparing your students to start thinking about their projects for science fair. Gather information on the topic. Research online or textbook. Ask your science teacher for help or resources. The Upper Fair projects can range from a beginners level to advanced levels. The best projects are the ones that follow the scientific method and students can articulate their findings and explain the details well. It is sometimes common for students to find their project ideas on the Internet and follow the directions exactly, but they have very little idea of how to explain the project and its importance. Teachers, challenge your students to be scientists. Please remember – originality is key to any good project. Judges can tell when a student has copied another's idea or if the project has been overdone. There is nothing wrong with advancing or building on a project that has already been done. Get the details of your local science fair from your science teacher. They will typically follow the international fair's guidelines, which the regional fair and state fair also follow. Research possible projects on the Internet for inspiration. Though, try to come up with an original project idea or further a project that has already been done. Develop a strategy or plan of executing the project. What are we trying to measure? How do we measure it? How do we record our results? Research your project early and get the paperwork done early! You may need to redo something later on or find that you need something for the project you hadn't planned on. Research the rules for projects based on their category so you will understand if there are any restrictions. Get the materials for your project and also for display purposes. Most fairs do not provide tables for projects, such as local and regional fairs. Also, a tri-fold presentation board is required for displaying information and pictures of the project. Start the project and make sure you have given yourself enough time to finish it before your local fair. Believe us, you do not want to have the stress of last minute projects. It can be inevitable though. Know the project and learn the science behind it. Think of possible questions that can be asked of your project or how to further it. Judges do ask questions at these science fairs, especially regional, state, and international fairs. And the most important piece of any science fair project, have fun! The Office of High School Academic Competitions and Special Programs serves as the coordinating office for pre-college competitions and conferences hosted by the University of Mississippi. The Office of High School Academic Competitions and Special Programs seeks to provide current information on all such programs in one central office.